“[After London 2012] I couldn’t find that goal, that drive to get going again. I sat down and thought to myself, ‘What do I really want?’ and ‘What can I do in this sport some more?’ I’ve made up my mind that if I want to be among the greats of Ali, Pele and all these guys, I have to continue dominating until I retire. ... I think [after Rio 2016] will be a good time to retire, on top and just been dominating for so long." - Usain Bolt talking about his career and retiring after trying to defend his 3 Olympic titles in Rio 2016. How many people can you think of that you would, without hesitation, give up your life to save? Australian Track & Field Loses Major Sponsor: Is this The End??? Good DailyRelay Interview With Ajee Wilson Talking about getting elbowed by Russia's Ekaterina Poistogova in the final meters at Worlds, Wilson said, "Afterwards, protesting honestly didn’t even cross my mind. ... It was a rookie mistake that taught me that I have to be my own advocate, and reminded me how important it is to speak up for myself." Shalane Flanagan And Alan Webb Working As Volunteer Assistant Coaches At Portland State This XC Season Both have said they want to coach in some fashion after their pro careers are over. Ryan Vail Says He's One Of Many In A Tough Situation After Competitor Group's Decision To Cut Elite Athlete Funding He and his coach had planned his training around doing one of the half-marathon races in October so now they will have to adjust. Collegiate Runner Jenna Parlette From Wilmington College Dies After Collapsing While Leading Race At Franklin College In Indiana She had been running with epilepsy and a heart condition for years and collapsed in a race in high school, but loved running and wanted to keep racing. Veronica Campbell-Brown Doping Hearing Enters Third Day The trial is closed to the media, but sources said that witnesses included a polygraph expert. Campbell-Brown is represented by California-based celebrity attorney Howard Jacobs, who served other high-profile clients such as Marion Jones, Tim Montgomery, and Floyd Landis. Samuel L. Jackson wants Usain Bolt to star in new film called "The Secret Service"
September 14th: Sally Pearson And David Oliver Highlight Competitive Hurdle Fields For The Great North CityGames Oliver faces Ryan Wilson and Aries Merritt while Pearson faces Dawn Harper, Kellie Wells and Tiffany Porter. Ben Johnson On Why Athletes Dope: "The money is great. The pressure is great. .. do everything to win. This is the world that we live in." Zagreb Mike Rodgers Wins 100 (9.97) As Justin Gatlin Is 3rd; David Oliver Ties Ryan Wilson With Dayron Robles 3rd In 110H, Dawn Harper Beats Sally Pearson In distance action, Caleb Mwangani won a fast 3,000 in 7:35 with Will Leer 7th (7:39), Andrew Bumbalough 8th (7:40), Nick Willis 10th (7:40), David Torrence 11th (7:40) and Andrew Bayer 13th (7:43). Russia's Ekaterina Poistogova won the 800 in 1:59.30 with Caster Semenya back in 5th (2:00.74) and Shannon Rowbury 8th (2:02.64), Hiwot Ayalew beat Milcah Chemos in the steeple. 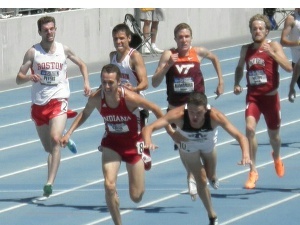 *Nick Willis' 7:40 Was A 4-Second PR Willis said, "My body and mind were in shock once I passed the 1,200m mark. ... I hadn't done anything to prepare specifically for a race over a mile, so it felt like I was just hanging on for dear life." Kenenisa Bekele Hopes That His New Training Camp In Sululta, Ethiopia Will Be The Next Iten He wants runners from all over the World, including "hobby joggers," to come train at his facilities. Tuesday Was Malcolm Gladwell's 50th B-Day: MB: Malcolm Gladwell has read Epstein's book - wonders why dopers are condemned for trying to overcome genetic disadvantages - Do Genetic Advantages Make Sports Unfair? 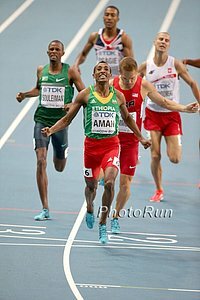 LRC Men's 800 Preview: Nick Vs. Mo Aman For All The Marbles In Brussels The DL finale is a great one with 7 of the 8 Moscow finalists squaring off, including World Champion Mo Aman, winner of 8 straight, taking on silver medallist Nick Symmonds, winner of 6 of 7. Duane Solomon, still the world leader, is also in the field fresh off of his 46.08 400m in Zagreb (video). 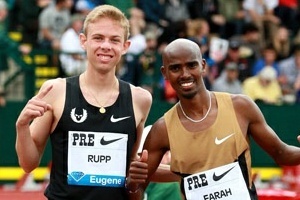 LRC Men's 5,000 Preview: A Dream Way To End The Season: Africa's Best Vs. America's Best Many fans may be sad that the 2013 DL season is coming to an end, but the last major distance race of the year is a REAL treat. The American record holders at 1,500/3,000/5,000 (Bernard Lagat), steeplechase (Evan Jager), and 10,000 (Galen Rupp) will clash for American supremacy as the six sub-13:00 men on the year from Africa will battle for world supremacy with the $40,000 DL title on the line. Everyone is there but Mo Farah and his absence shows why he's got a long way to go catch the likes of Haile Gebrselassie or Kenenisa Bekele for GOAT status. More previews coming later. MB: Stat geeks – help us out – when is the last time thw US 1500/5000, steeple, and 10,000 record holders raced in the same 5000? 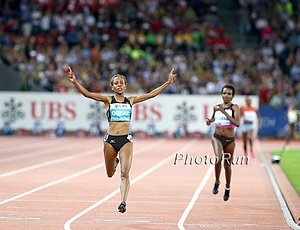 More: IAAF Full Meet Preview: Moscow Rematches The Theme For Brussels Good matchups include Abeba Aregaw vs Jenny Simpson and Hellen Obiri in the 1500, all 8 women's 400 finalists including Christine Ohuruogu and Amantle Montsho, Teddy Tamgho vs Pedro Pichardo and Christian Taylor in the TJ, World champion David Storl vs Ryan Whiting in the SP. Usain Bolt Says He'll Retire After Rio 2016 And That He Won't Take An Off Year Next Year "I think it will be a good time to retire, on top and just been dominating for so long." 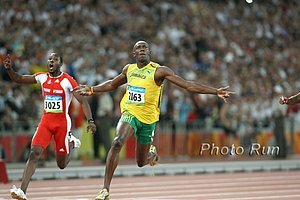 Bolt Laughs At Ben Johnson's Suggestion That He Could Beat Bolt If They Had Been Competing At The Same Time Bolt said, "Everybody says everything to get into the media and stir up a little bit, but he could never beat me. That's just him trying to get some attention. I don't see Ben Johnson beating me at any time." Bolt Says He Still Thinks He Can Break The 200m WR And Is Looking Forward To Next Year With No Major Championship And He Can Focus On Running Fast “The 100m World record is the hardest to break because it is more technical. In the 200m, if I can master the bend and stay injury free, there is room for improvement." IAAF: 16 More Overall Diamond League Winners To Be Decided In Brussels 9 events are already locked up, but the last 7 are up in the air. The men's 5,000 will come down to Hagos Gebrhiwet and Yenew Alamirew, the women's high jump between world champ Svetlana Shkolina and Anna Chicherova and the women's steeplechase could be won by any 4 women. Infighting Among Athletics Kenya Officials Continues To Heat Up As Isaiah Kiplagat And His Opponents Talk To The Media South AK chairman: “Why is [Kiplagat] resisting the [meeting] if he is claiming to uphold the constitution? It’s because he knows that something he has done is not right and this is what we want to address,." Kiplagat: “I am ready to leave office through a fair process, but I will not allow the law of the jungle to prevail and bring ridicule to athletics in this country." WR Holder Patrick Makau And 2nd Fastest Man Ever Wilson Kipsang To Team Up To Go After WR At The Berlin Marathon On September 29th They are serious about the record attempt, with Kipsang even in brining along his own training partner as a pacer. 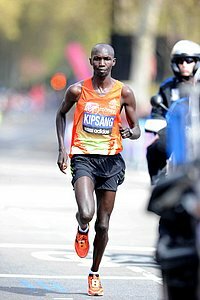 Kipsang said, "If the weather and other factors remain constant, running under the 2:03 mark is very much possible." The women's field will include Irina Mikitenko (2:19:19), Desiree Davila (her first full marathon since dropping out of the Olympics) and Kenya's Florence Kiplagat (2009 Berlin champ). World 400m Champion Christine Ohuruogu Racing Over 150 Meters At Great North CityGames On September 14th She'll race US's Natasha Hastings and Jamaica's 2004 Olympic sprint relay gold medallist Aleen Bailey. Good News For Road Racers: Road Races Might Have More Porta Potties In The Future As The Industry Looks At How It Calculates Demand The new portable toilet standards for road races are expected to be in place by next summer. Interesting: JapanRunningNews Q&A With Japanese Olympic Marathoner Arata Fujiwara He's racing in next week's Bupa Great North Run Half along with Mo Farah, Haile Gebresalasie and Kenenisa Bekele and predicted Farah for the win. 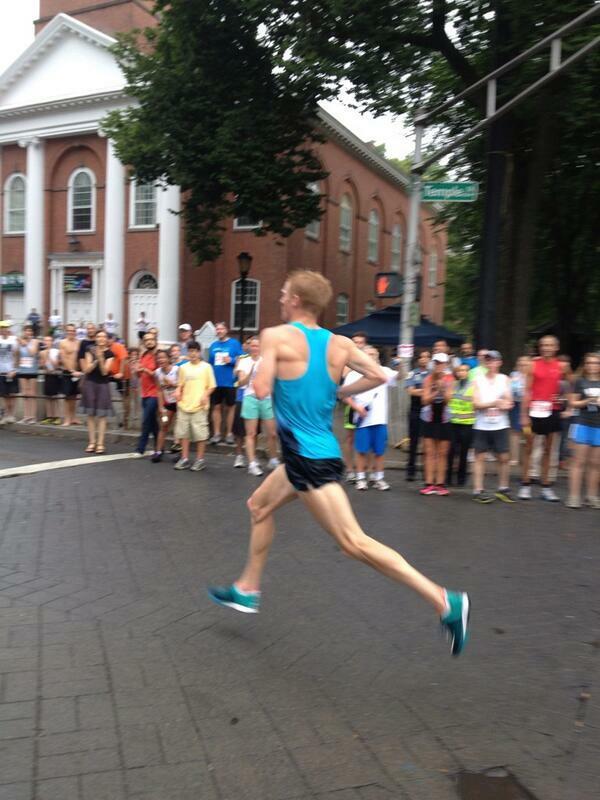 He also asked Brett Larner why US distance running has improved so much. Inaugural Plusnet Yorkshire Marathon On October 20th Will Have The Highest Amount Of Prize Money Anywhere In The UK Outside Of London They'll be giving a total of £12,000 ($18,700) in prize money in the race's first year. Opinion Piece: Why 2020 Olympic Bidders Should Be Hoping For Second Place "In seeking to host the games, coming in second tends to work out better, say economists who have studied this phenomenon. The runner-up tends to invest in the same sort of infrastructure aimed at impressing the Olympic committee ... then gets spared the expense and hassle of actually hosting the games." Swoosh Takeover: UK Athletics Switches Its Kit Supplier From Adidas To Nike After Adidas Loses Courtroom Challenge Adidas tried to stay GB's sponsor going to court arguing its current contract included a "matching rights" clause that gave it the right to match any rival offer when the deal came up for renewal, but they lost.